JobMob is sponsoring the first Israel Multilingual Job Fair. 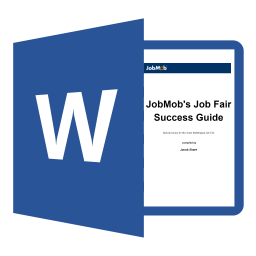 Recruiters and HR experts: Mention coupon code JOBMOB for a 20% discount on booths at the fair. I've wanted to sponsor a job fair for a while, so I'm excited that JobMob is going to be a part of this. Come meet the leading companies on the market, enjoy our fascinating lectures from different speakers, and connect with HR representatives from all of the hottest international companies on the market. Make yourself standout and find a job. Check back here closer to the fair for an updated schedule. To exhibit at the fair, contact Segev Shoval. Mention coupon code JOBMOB for a 20% discount on booths. Subscribe to JobMob via email and follow me on Twitter for job fairs you just might want to go to. If you like to help people, why do you charge a fee for job-seekers? I’m not organizing the fair, just sponsoring it, so you’ll have to ask them about the entry fee. However, as I also run a business, I see no problem whatsoever with charging people reasonably for products and services. For example, such job fairs take a lot of time and money to bring to life. In my case, I like to provide a free option, which is why this blog, JobMob, has hundreds of articles + exclusive downloads that are 100% free and have been for almost 10 years and counting, and that’s a lot. Perhaps more job seekers would attend if there was just a nominal charge or if it was free? Maybe you could suggest that the companies pay more for the booths? I’m not organizing the fair, just sponsoring, so I can’t change prices for anything, but I’m sharing all feedback with the organizers. They’re very interested. I think 20 shekels is a nominal charge. It would take an awful lot of job seekers for the organizers to make a profit at that rate, but I don’t think that’s the goal here. Rather, such nominal fees are often used to separate the serious from the non-serious, for the benefit of all attendees but in particular, the ones who paid much more to be there: the employers. I’d very much like to attend the fair. But as a new oleh, my first priority is ulpan which takes place daily. Is there anyway I can e-mail my resume and writing samples to the exhibitors at the fair that are seeking professional writers and editors like myself? There’s no simple way, however it doesn’t really matter. Exhibitors are trying to get the word out that they’re hiring, and briefly meet & attract potential candidates. While the latter would require you to be there, the fair website lists most if not all the exhibitors which means you can easily see who’s hiring and can reach out to them directly. You might consider posting writing samples on a personal website and uploading them to a Dropbox account and then linking to them in a cover letter. How can I see the full list of companies represented on the fair? would this job fair also be for people who have been in ISrael for a long time (20 years) and who are seasoned professionals but are currently looking for a good position (50yr +)? 1)Far to Tel Avv centric. If you want people getting there you need to have it running a full day not just 6 hours And you could have chosen somewhee central and easy to get to rather than TA in the rush hour. Anywhere would have been better. Great feedback, George, that will have an impact on the next fair. Thanks for taking the time.